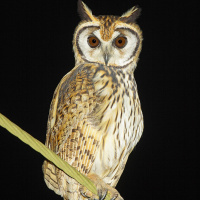 Introduction: The Striped Owl is a small to medium-sized owl with well developed ear-tufts. Whistles - Brazil. © Nunes D'Acosta. Description: The facial disc is brownish-white, with a distinct blackish rim. Eyebrows are short and whitish, and the eyes are brown to cinnamon. Lores are whitish, while the cere is greyish and the bill blackish. The ear-tufts are long and prominent, mostly blackish and somewhat tousled. Upperparts are tawny-buff. 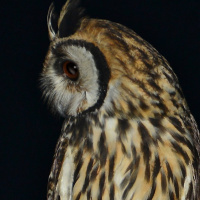 The forehead, crown and nape are heavily streaked dusky. The mantle and back are mottled and streaked dark. The scapulars have whitish areas on the outer webs, forming an indistinct row across the shoulder. Flight feathers and tail are barred pale and dark brown. There is a blackish, plain patch at the wrist on the alulae which is very obvious in flight. 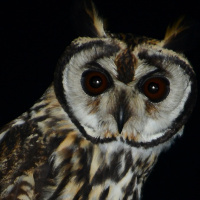 The throat is white, and underparts are pale tawny to buffish-white, prominently streaked dark brown or blackish. Tarsi and toes are feathered creamy. The claws are blackish. Size: Length 30-38 cm. Wing length 228-294 mm. Tail length 127-165mm. Weight 320-556g. Females are heavier than males. Habits: Mainly nocturnal, becomes active at sunset. 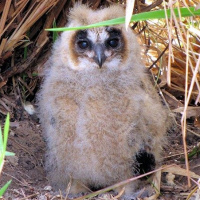 By day the Striped owl roosts in dense foliage of small trees or shrubs, sometimes on the ground beneath vegetation cover or even in pine plantation. During the non-breeding season several individuals may gather in flocks and roost together by daytime. These owls fly with rather shallow and rapid wing beats over open areas. Home range can be approximately 7 square km. Voice: Emits a long, strident, hawk-like whistle wheeyoo. The song of the male is a series of well-spaced nasal hoots, while female gives a similar but more shrill song. Both sexes have series of barking calls and fledged young give high-pitched screams, weehe. 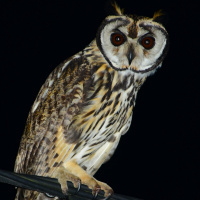 Hunting & Food: Striped owls hunt mostly during crepuscular and nocturnal hours. Small mammals and birds are its main prey. Mammalian prey includes spiny rats, rice rats, cavies, bats and opossums. Bird prey includes doves, grassquits, flycatchers, thrushes, house sparrows and tinamous. Other foods include large insects and a few reptiles. Pellets are irregularly shaped and mostly light grey. Its powerful talons including long claws indicate large average prey. 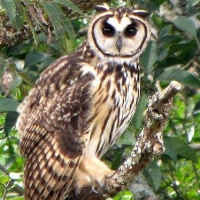 Indeed, the Striped Owl may take prey approximately 0.7 times its own weight, such as pigeons, cavies and white-eared opossums. Its hunting technique is described as a low flight over open landscape, with abrupt dives after prey. This owl also sits on a perch and watches prey ready to catch them. Breeding: Two to four eggs are laid in rudimentary nests found on the ground in long grass and dense bushes. The female alone incubates for approximately 33 days. Probably only one chick fledges successfully, though two fledglings have also been observed. Mortality: Observations on mortality include road kills and shootings. Natural enemies include probably larger owls and birds of prey. 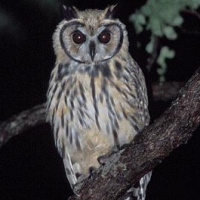 Habitat: This owl prefers open or semi-open grassland and savannas with scattered trees, small groves and bushes. It also occurs in open marshland with bushes, pasture and agricultural land, as well as in wooded suburban areas. Usually not present in dense forest, avoiding Amazon basin. Ranges from sea-level up to approximately 1600m. 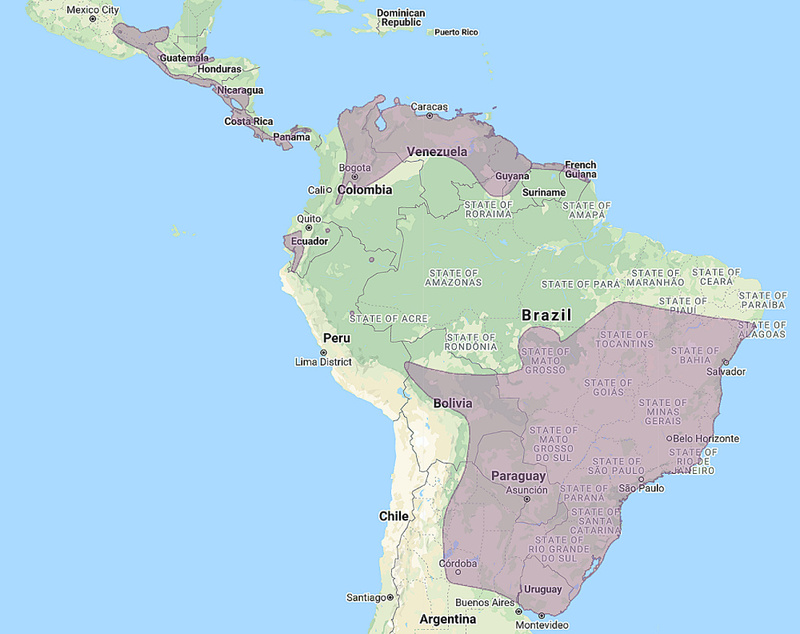 Distribution: Striped owls are distributed from southern Mexico to Panama, and from northern South America to Uruguay and north Argentina, east of the Andes. They apparently do not occur in the Amazonian Basin and appear to be resident year-round. 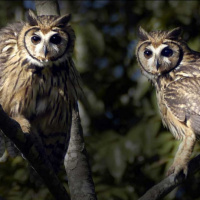 See also: Other owls from North America, Central America, South America, Genus: Asio. Page by Deane Lewis. Last updated 2016-02-05.